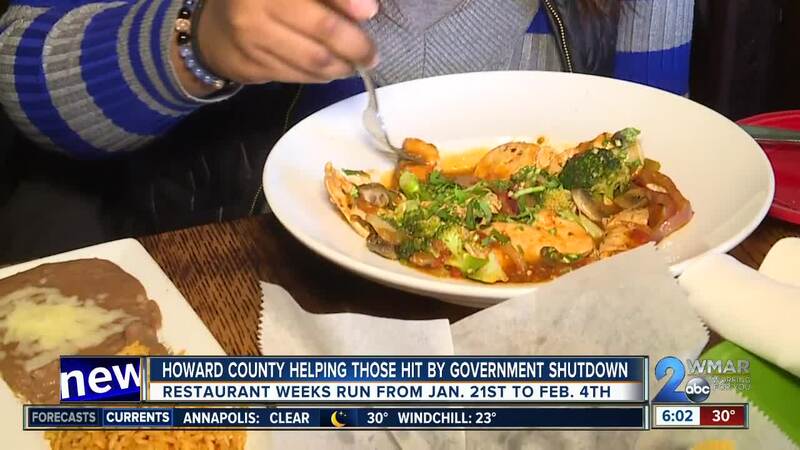 ELLICOTT CITY, MD (WMAR) — After more than a month of the partial government shutdown, the effect of the gridlock is trickling down into restaurants in the surrounding area, including Howard County. "That was an especially difficult time for restaurants. Restaurant weeks, fortunately, caught on and people loved it. We started from eight restaurants to now over 30 restaurants," Amanda Hof, the executive director of Visit Howard County, said. She's been tested before -- helping to bring business back to a strip in Ellicott City twice decimated by flood waters. In what started as a way to jump start the local economy after the recession in 2008, Hof and County Executive Dr. Calvin Ball say these restaurants weeks during the partial government shutdown could make or break many shops in the area. "There are so many families and businesses that are struggling. So being able to, throughout these next two weeks, not only come and support local businesses, but do it on a budget and be able to frankly lift up the spirits of families which is something so needed right now," Ball said. Data from the county shows about one in every ten homes in Howard County are directly impacted by the shutdown, which means less food on tables in the restaurants, and forcing people to consider how they'll get it onto their own. The discounted fare is an attempt at helping those hurting, while drawing a crowd back to eating out. "I think here in Howard County, we can set that example for D.C. of coming together and making things happen," Ball said. It's a show of solidarity amid a political tug of war and those in Howard County hope the draw helps keep restaurants afloat. "The ripple effects from the shutdown -- that's employees that the restaurant industry supports, that's food on the table," Hof said. Restaurant weeks in Howard County are between January 21 and February 4. For a full list of where you can go to get a deal, click here .